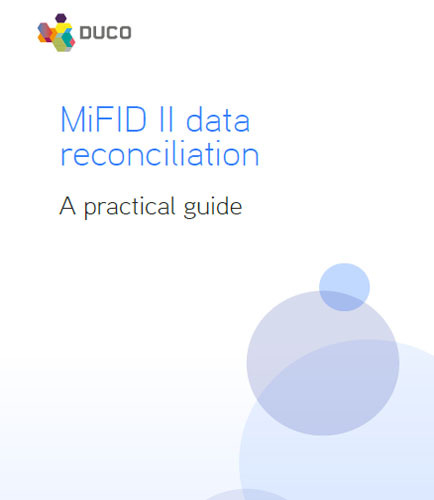 "A practical guide to MiFID II data reconciliation"
Data risk is an increasing challenge in the financial industry, for the innumerable processes that need to be taken care, before reporting the data to the regulators. It is extremely important to stay complaint and maintain data quality for Markets in Financial Instruments Directive II (MIFID II) during data reconciliation. Duco Cube with its powerful and flexible reconciliation platform enables users to navigate directly to any underlying issues if and when they occur. The company is a completely secured hosted service that can easily support data reconciliation till the end and also ensure the accuracy and consistency of the same throughout. How Duco Cube helps firms through the lengthy ETL processes without transforming the projects? What are the key factors to be considered for MiFID II data reconciliation? How can ARMs reporting be handled with Duco Cube? Reinventing the RFP: Getting the Most Out of Your Document Review Platform in 2016…and Beyond? Unsure about what the top considerations for your next document review platform RFP should be? In 2016, any software worth its salt in document review must not only have the new Request for Proposal (RFP) features, it must reach beyond the status quo to deliver workflow productivity tools. To make the RFP process more dynamic and relevant to your organization’s needs, present applicants with sample scenarios and actual test data, as well as an overview of your existing workflow. This white paper “Reinventing the Request for proposal process,” focuses on the following: How to implement a web based document review platform successfully? Total Cost of Ownership: Is the Request for Proposal (RFP) telling you everything? How to enhance the document review process and maximize productivity? What are the major litigation challenges in managing document review platform RFP? Let your Request for Proposal serve as the first step in advancing your culture for excellence with a document review platform that meets the needs of both today and tomorrow. One of the main criticisms of the original MiFID was that national regulators did not enforce the directive with the same zeal across Europe. The list of financial instruments covered has been extended to almost all instruments traded in European markets – with particular emphasis on the OTC derivatives market that was previously out of scope for MiFID I. The issue with making this distinction across so many different instruments is one of the main reasons why the MiFID II and MiFIR implementation date has been delayed twice from its original start date of January 2015. While regulators have not specifically outlawed the use of spreadsheets and UDAs, it is commonly accepted that under MiFID II, organizations need a much more robust and scalable approach to data control. What are the data problems that MiFIR transaction reporting requirements are likely to cause? What is the impact of the new regulations on firms? What is the cost of non-compliance? Move ahead and read the following whitepaper that will address all your questions, including these: How to identify traders or algorithms involved in the decision and execution process of a transaction? Which general fields will require extra reconciliation steps? What are the number of data fields required on transaction reports and the reporting requirements? How to trade instruments on an approved venue? Which legacy systems can be replaced and which ones are difficult to scale? What is Data Reconciliation ? Data Reconciliation is a process of verifying data during data migration, where the target data undergoes a comparison with the original source data to make sure that the migration architecture has transferred the data accurately. There are high chances of mistakes to be present in the mapping and transformation logic. Along with this, failures like broken transformation and runtime failures can lead to data loss or invalid data.